THE LORD MAYOR of Dublin will call for a meeting with acting Garda Commissioner Nóirín O’Sullivan to discuss “excessive” Garda force at water meter installation protests in north Dublin. Dublin City Council passed a motion on the issue tonight, with 29 councillors voting in favour, 20 voting against and four abstaining. In a heated debate, Fine Gael’s Kieran Binchy accused those who supported the motion of being like “jumped-up little Stalins who are trying to cause conflict within communities”. Binchy later tweeted that he got “a bit carried away” during the debate. @orlaryan I did get a bit carried away. Just got annoyed at people creating conflict then condemning the same conflict. Binchy said he didn’t believe in free water, adding that he thinks metering is a fairer way than taxation for people to pay for it. He said that he accepted people’s right to protest but noted that those obstructing the installation of water meters were breaking the law. Michael O’Brien, of the Anti-Austerity Alliance, said that people struggling to make ends meet ‘trump’ laws in this instance. I don’t accept the idea that the law is the law and that’s the end of the matter. Fine Gael’s Naoise Ó Muirí said that the council should seek to hear the views of Irish Water workers who are “going to hell on earth just trying to do an honest day’s work”. Sinn Féin’s Mícheál Mac Donncha said he is aware of protests where there have been six protesters and up to 30 guards, adding he is “certain gardaí would rather be doing their proper policing work”. John Lyons of the People Before Profit Allaince, who was arrested last week at a protest under section 12 of the Water Services Act, said that water charges are “fundamentally wrong” and “unjust”. What you’re seeing on the streets is democracy in action. Several councillors said that the heavy-handed actions of gardaí at protests have damaged relationships between communities and the force. “The right to a peaceful protest must be protected,” he added. Damian O’Farrell (Independent) claimed that some gardaí were “no more than bullying people”. Fine Gael’s Paddy Smyth refuted this, stating that gardaí “risk their life and limb” to do their job. He added that the motion was “cynically whipped up my members of this council who should know better” and showed “an enoromous lack of respect” to the force. Labour’s Dermot Lacey reiterated this saying the picture people were painting was “inflammatory” and not representative of the gardaí he knew. I do deplore the way in which some councillors are encouraging people to go out on to the streets. Lacey said that this “distracted” gardaí from more important work. 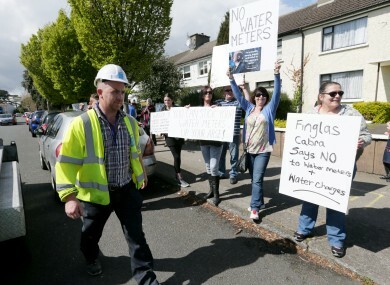 Fianna Fáil’s Paul McAuliffe said that he had issues with some elements of the motion, adding that he didn’t agree with protesters who had obstructed the installation of water meters “in the exuberance of the event”. Lord Mayor Christy Burke, who supported the motion, told councillors he has already sought a meeting with Assistant Garda Commissioner John Twomey to discuss the issue. “There’s a fear of people in my constituency in relation to the bills that are going to come in January,” Burke added. The emergency motion was put before the council this evening by eleven councillors, namely Michael O’Brien (Anti-Austerity Alliance), Pat Dunne, Tina MacVeigh, Bríd Smith, Andrew Keegan, Sonya Stapleton, John Lyons (all People Before Profit Alliance), Cieran Perry, Eilis Ryan, Gary Gannon, Damian O’Farrell and Paul Hand (all Independent). Email “Irish Water, Garda criticism and references to Stalin - Dublin City Council had a busy meeting”. Feedback on “Irish Water, Garda criticism and references to Stalin - Dublin City Council had a busy meeting”.